Do you love your patio or deck but find yourself avoiding this space during the hot summer months? The sun’s heat and glare can be intense, but that doesn’t have to render your outdoor space unusable. Toms River Door & Window can install a sturdy and beautiful retractable awning at your Jersey Shore home to create a shaded outdoor oasis that you can enjoy all year long. Size – Whether you need a bit of shade over an outdoor table or you want to cover an entire pool area, we have the perfect fit. Color – We offer a wide selection of fabric colors and patterns as well as your choice of frame color to ensure your retractable awning complements your home’s exterior beautifully. 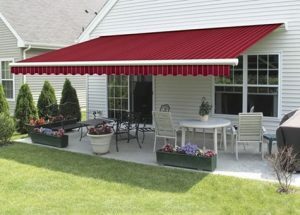 Operation – Our awnings can be rolled up manually, or they can be motorized for quick and easy operation. Accessories – Make your outdoor space feel like home by adding lighting, privacy shades, and other finishing touches. The retractable awnings we install are crafted from the highest quality materials to ensure they are durable enough to stand strong when faced with high winds and other weather extremes. Plus, we never hire subcontractors. We train our own team of professional technicians, so you can be confident they have the skill needed to complete a flawless installation. As the longest standing exterior home remodeling company in the area, we are proud to help members of the Jersey Shore community better their homes, and we are confident that a retractable awning will help you get the most out of your outdoor living space. We would be happy to provide a free consultation and estimate so that you can learn more. Contact us today to get started.